Also called Flush Valve Seal, is the rubber object, which plugs the drain hole at the bottom of the tank and holds the water back. Check the Flapper for any kind of defect such as deteriorating rubber, breaks in the seal or anything wrapping around it or excessive dirt allowing for the water to pass through. The replacement of the flapper is easy, as it pops right on the chain. Flappers should always be attached to the chain in the center of the Flapper. The chain connecting the Flapper to the toilet can easily become tangled which keeps the Flapper from closing and in-turn causes the toilet to run. Ensure the chain is not too long or too short, as both scenarios can prevent the Flapper from closing properly. The chain should have just one inch of slack, what can be achieved by cutting a chain or buying the right length from the start. The Float is the plastic ball or cup, which indicates whether your water level is full for the toilet. A Float that is set too high will raise the water level above the overflow pipe, which results in a overflow or running tank. To repair a high ball Float, you can easily and slowly bend the arm down a bit. Cup floats can be fixed by sliding the Float down the central tube. If these DIY tricks are not working and your toilet continues to run, consider calling a professional to help diagnosis the problem and fix quickly. 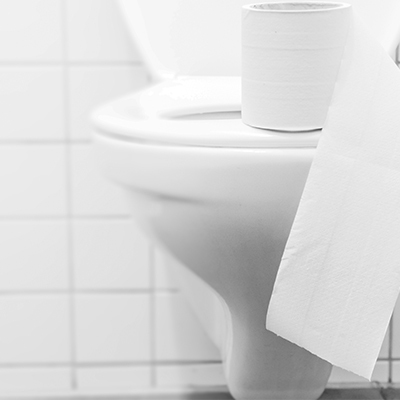 Overflowing or running toilets create home flooding situations quickly.